Sturm, Ruger & Company, Inc. (NYSE-RGR) proudly introduces magnum models of the Ruger Precision® Rimfire rifle and a new BX-15® Magnum magazine. Faster, flatter and with high-performing bullets, .17 HMR and .22 WMR cartridges expand the capabilities of the Ruger Precision Rimfire platform. Like its .22 LR predecessor, these new magnum offerings maintain the same ergonomics, trigger and manual of arms as the larger centerfire Ruger Precision Rifle. 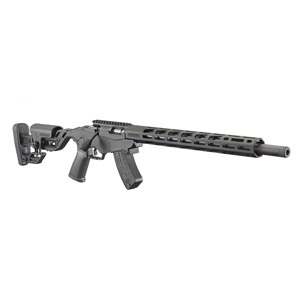 The Ruger Precision Rimfire's molded, one-piece chassis and adjustable buttstock assembly are manufactured from strong glass-filled nylon, offering a solid foundation for accuracy. The innovative Quick-Fit Precision Rimfire stock allows the rifle's length of pull and comb height to be quickly and easily adjusted for proper fit over a wide range of shooter sizes, outerwear and shooting positions. The 18" cold hammer-forged target barrel features ultra-precise rifling for excellent accuracy and a 1/2"-28 muzzle thread pattern for easy pairing with muzzle devices, including the Ruger® Silent-SR®. The 15" free-float handguard with Magpul® M-LOK® slots provides generous scope clearance and easy mounting of M-LOK-compatible rails and accessories. Additionally, Big-Gun bolt throw adjustment technology allows shooters to experience the long bolt throw of a centerfire cartridge, like 6.5 Creedmoor, improving the Ruger Precision Rimfire's capabilities as a training rifle. 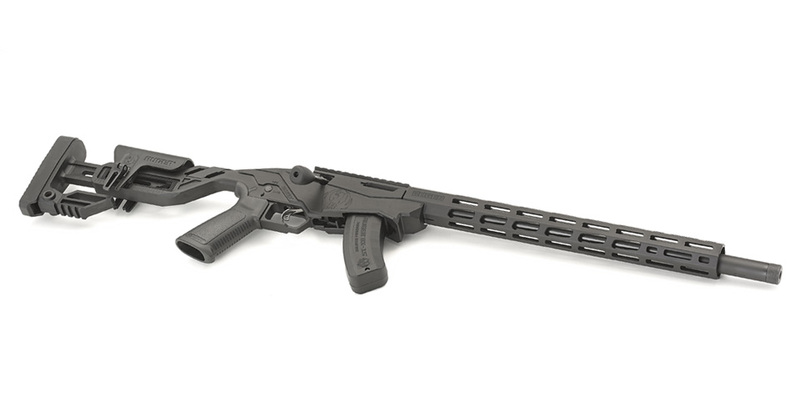 The popular Ruger Marksman Adjustable™ trigger can be externally adjusted from 2.25 to 5 pounds with the adjusting wrench that is conveniently stored in a buttstock compartment on the rifle. Ruger's own AR-pattern pistol grip and safety selector allow for maximum control and access to the 45 degree, reversible safety selector. The rifle is topped with a 0 MOA Picatinny scope base and ships with one, 15-round BX-15 Magnum magazine or one, 9-round JMX-1 rotary magazine. The new, 15-round BX-15 Magnum magazine incorporates technologies that have made the .22 LR BX-15 and BX-25® magazines famous and also features the same feed lip geometry that has proven reliable in the 9-round, JMX-1 rotary magazine. The BX-15 Magnum is a natural pairing for the new Ruger Precision Rimfire in magnum calibers. It is also compatible with Ruger 77/17®, Ruger 77/22® and Ruger American® Rimfire rifles chambered in .17 HMR and .22 WMR. The stainless steel feed lips and "constant force" spring combine with a high-lubricity, polyacetal, anti-tilt follower and durable, glass-filled nylon magazine body to make the BX-15 magazine rugged, reliable and easy to clean. For more information on the Ruger Precision Rimfire or to learn more about the extensive line of award-winning Ruger firearms, visit Ruger.com or Facebook.com/Ruger. To find accessories for the Ruger Precision Rimfire, like the BX-15 Magnum, visit ShopRuger.com or your local independent retailer of Ruger firearms.